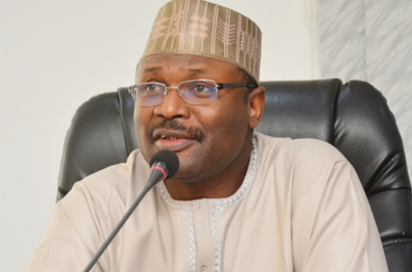 ABUJA—Nigerian Security, Printing and Minting, NSPM, Plc has pleaded with chairman of Independent National Electoral Commission, INEC, Mahmood Yakub, to award the contract of producing election materials for the 2019 general elections to it. Managing Director and Chief Executive of NSPM, Abbas Masanawa, who disclosed this to State House correspondents after meeting with the Vice President, Prof. Yemi Osinbajo, at the Presidential Villa, Abuja, yesterday, said the minting company had the capacity to handle all election materials for the election. He said his organisation had met with the INEC chairman to discuss the matter, expressing optimism that INEC would consider his request. He said: “We are hoping we have the capacity, we are hoping not only to compete with others, we are hoping if INEC will give us the opportunity, we have the capacity to do 100 percent of not only the ballot paper, but all the electoral material in 2019. “We are pleading with INEC, we are trying to see how they can give us, we have been talking with them. We say instead of INEC to take it somewhere else outside the country, it is something that we can do. He said that the Mint management met with the INEC Chairman last week, and that INEC promised to support them. “Mint is a goldmine and what we have achieved is not to be compared with what we are capable of achieving, we believe we will be able to do better over time,” he stated. He said he would bring to bear his private sector experience as the Managing Director into the public sector. “What you find in public sector is quite different from what you find in private sector the mint is so lucky to have some of us from the private sector and we are bringing our experience from the private sector,” he said. There have been outcry over the printing of the nation’s passports in Malaysia as some have argued that the assignment could be handled in the country by the NSPM. Some argued that the passport being a very important and sensitive document should not be taken outside the country, stressing that if the nation’s currency could be handled locally, there was no need of printing passports outside.